As a freelance writer, I pride myself in being able to submit premium articles for my clients. I believe that by presenting your ideas in a clear manner, you can effectively communicate them to readers. That means having the correct grammar, spelling, phrases, and prepositions. As a blogger, there are so many tools available at your disposal that distracts you from what matters most – providing your audience with great content. As a blogger and freelance writer myself, I have been caught with the plugin bug but was able to trim down my use to its bare minimum. However, none of these plugins are as indispensable in what I do as Grammarly Premium. It is my tool of choice as a writer and blogger. I cannot imagine writing articles without running it on Grammarly. I make sure that all the articles ordered from my content writing services go through Grammarly first. Note from the Editor: All links that point to Grammarly Premium are affiliate links. If you click on the links and successfully subscribe for an account at Serpstat, I will receive a commission of the sale. If you like the tool, then I would highly appreciate it if you sign up to Serpstat using any of the links here or by clicking here. Thanks! Usability – Is it easy to use? Can it be used on different platforms or devices? Proofreading – Does it spot errors and provide the correct suggestions? Productivity – Does it help me improve my writing? Also, to clarify, I am not reviewing the free version of Grammarly. I am reviewing the paid version of Grammarly, which is Grammarly Premium. Why do I think Grammarly Premium is best tool out there for writers and even bloggers? A year ago, I wrote a fearless review about Grammarly and how it has helped me produce flawless content for my clients. To further elaborate on the review, I would like to focus on the available features of the Grammarly Premium tool. Insights – The Document Insights feature allows you to crunch the numbers and raw data about the article. Depending on your goals for the article, you’ll have your hands full with the information found here. Personally, the Readability section is the most important one here. It shows you how easy or difficult to read your article is. Update Goals – Choose the type of document you are writing about for the tool to edit your content accordingly. Every time you start, the General document type is chosen. If you want a specific type to be used, you can select from Academic, Business, Technical, Medical, Creative, and Casual. For example, if you chose Business > Article/Blog post option, Grammarly will detect contractions (you’re, I’m, and others) and misused commas to help tighten your article so your document will look much more professional. 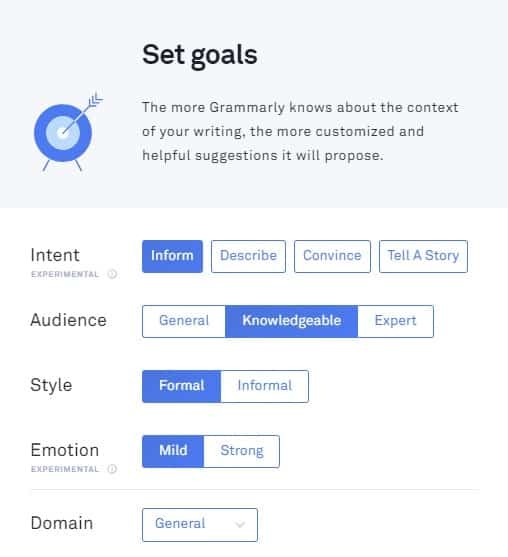 To help Grammarly Premium give you a more accurate score, you need to refine your goals. By targeting the right intent, audience, style, and emotion for your article, the tool can help you produce the best article better. This is one of the best features of the tool. Grammarly Premium assists you in writing a personalized article or content based on the type of document you want to achieve. Whether it’s writing a thesis, technical document, or a personal blog post, Grammarly Premium has got you covered! While the errors spotted in the premium alerts aren’t crucial ones, it’s the little things that affect the article’s quality. This spell checker tool makes your job much easier as a result. If you’re truly serious with your writing career, you need to sign up for a Grammarly account and upgrade it to Premium. Click here to get started! Plagiarism – Turning this on allows you to see if your document or the document you are editing has been plagiarized from an online source without proper attribution. 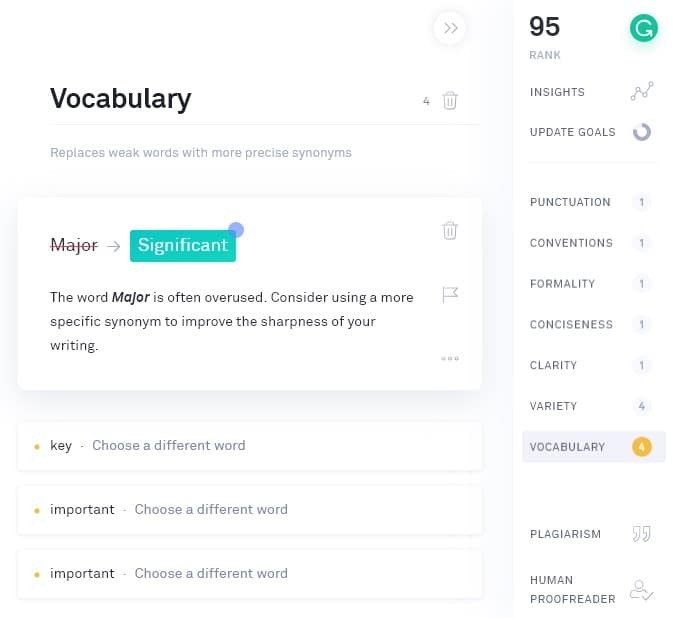 Grammarly Premium’s builtin plagiarism checker scans your document and runs it through 8 billion pages online. Once it spots a plagiarized text, its built-in Citation Generation will create the citation for you using three styles — MLA, APA, and Chicago. Even if you do not know the format of the citation for your paper, Grammarly has got you covered! 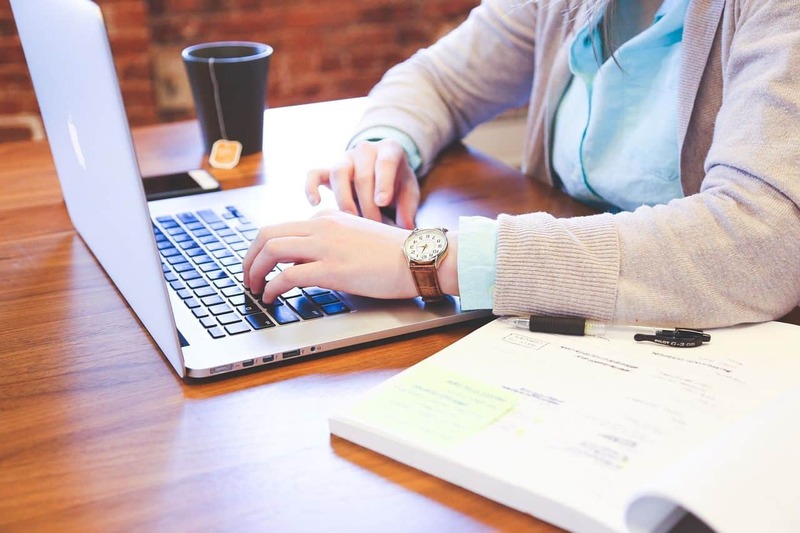 Human proofreader – If you’re not confident with the article and are not satisfied with how you edited it, you can ask help from an actual proofreader. 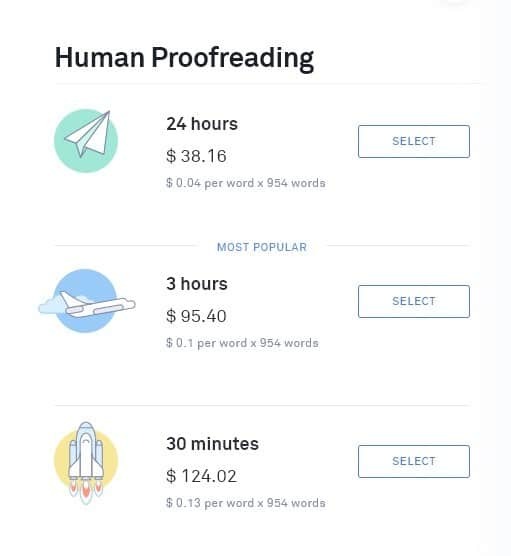 While this is an extra cost on top of your Premium subscription, it’s worth every penny if you want to get your article edited and maintain its readability for humans. Chrome Extension – Once you download this extension for your Google Chrome, you can enjoy its features while browsing online. The extension will aid you in writing from your email provider like GMail. Upon clicking on the red dot at the bottom-right side of the window, you will open the editor within Chrome. The extension also works on blogging sites like WordPress, Tumblr, and Blogger, as well as other sites where you can enter text. If you prefer using Mozilla Firefox, there is also a Grammarly add-on, which works the same way as the Chrome extension. Browser version – If you want to edit your article straight from Grammarly, then you need to login to your Grammarly account from the website. Once you log in, you can start with a new document, edit existing ones that you have uploaded or saved, or export the articles saved in the app to your hard drive. When you click on the document icon to write a New post, you will be directed to a minimalist text editor. This is a great place to write your article and focus on the content without being distracted by the different features of your usual word processor. If you have an existing article that you want to edit and improve using Grammarly, you can upload it and spot the errors from there. If you have links and images featured in your article, they will not show on the Grammarly editor. However, you can access them again when you download the article after editing it. When editing the article, click on the “Correct with Assistant” button on the top-right green button of the screen. Once you’ve fixed the article download the file, you will see that the changes will appear as comments from Grammarly. I use WPS Writer as my word processor. If you are an editor, you may want to keep the comments so your writer will be able to see the changes made in the article. For freelance writers and bloggers, you can delete all the comments at once from your word processor and send the post to your client or blog. Native Grammarly app – You can download the native app for Windows if you prefer running Grammarly Premium as a separate program. It takes up approximately 46MB of your hard drive and has the same UI and feel as the browser version. Microsoft add-on – You can edit your articles using Grammarly Premium feature straight from Microsoft Word. All you need to do is download the add-on file from the site. Unfortunately, I have not tried Grammarly on Microsoft Word because I use WPS Writer as my word processor. More on this later. NEW! Google Docs – If you write your articles on Google Docs, then you’re in for a treat. 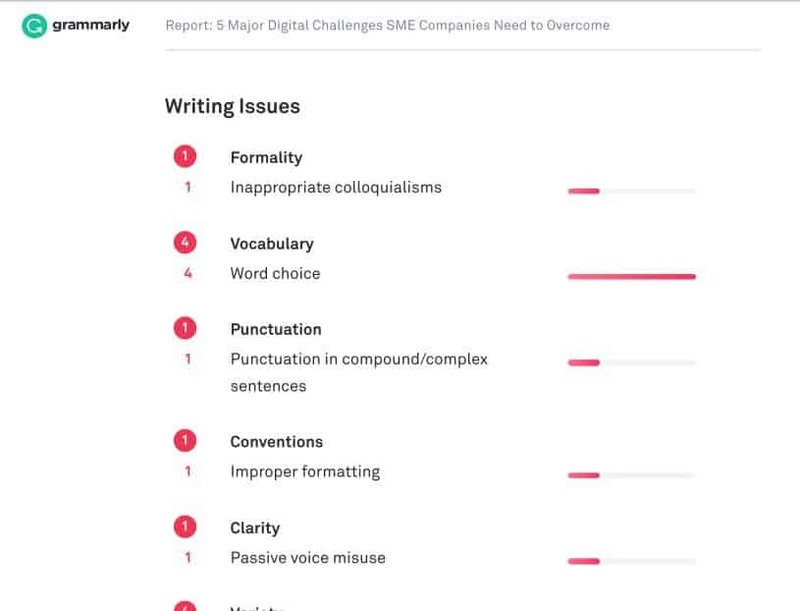 Grammarly now supports editing straight from the writing tool. The problematic words and phrases are underlined in red. Hover your mouse to see the suggestions and make the corrections. Currently, the Google Docs feature of Grammarly is still in beta which explains the limited options available. Over time, however, we may see improvements until it fully integrates itself with the software. Personally, I’m just happy that the feature now exists since I’m a heavy Google Docs user. Now that we have the main features in place, below are my honest thoughts about using Grammarly Premium to improve your writing. While I pride myself on providing great content in English as a non-native speaker, there are still errors that slip through the cracks. The mistakes may not be as crucial considering the meat of the content, but I take pride in my job. Every error is a chink in my armor. With Grammarly Premium, I can correct my mistakes and provide clients with impeccable content writing services. 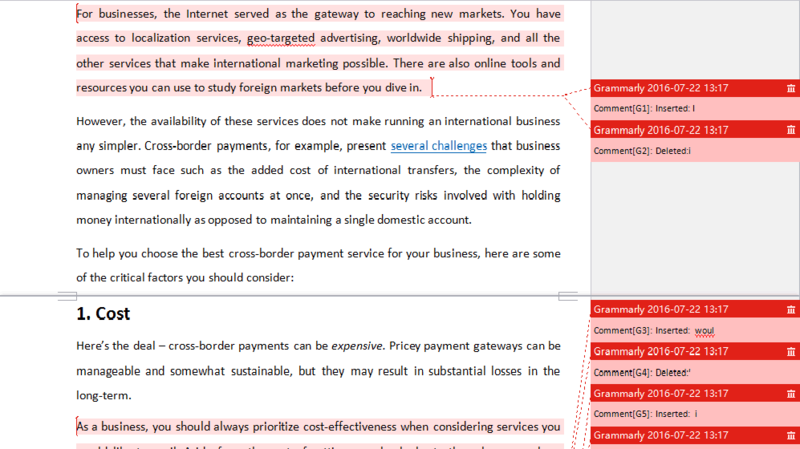 In this screenshot of Grammarly Premium, you will see the possible mistakes you will have committed on your article. If you are a freelance writer, the last thing you want to do is review the article that you just finished writing for mistakes. Before you do this, you may need to step out and take a breather or sleep on it so you can have a fresh and well-rested set of eyes so you can spot errors. However, imagine the hours and days you wasted by taking a break or sleeping on the article when you could have sent the article to your client or site for review. Therefore, instead of running through your post one more time, Grammarly Premium will spot the possible errors for you as you write your post. You can click on the most appropriate suggestions or edit accordingly. You can hover over the word or phrase in question by the tool and see the possible error you may have committed. If you click on the “More” button, you can learn more about the mistake, so you know what you need to do to fix it. If you are an editor, Grammarly Premium will spot the errors for you! Better yet, you can upload the written work on Grammarly and download a detailed report of the errors committed by the writer and its cumulative score. Use the score as the basis for grading their writing performance. If you’re an editor, you can manage the article they submit to you so you can show it to them. Click on the Document Insights and scroll down to see the Download button. You can get a PDF file of the insights and share it with the article of your article. This is perfect if you have yet to set editorial guidelines in place for your writers to follow. 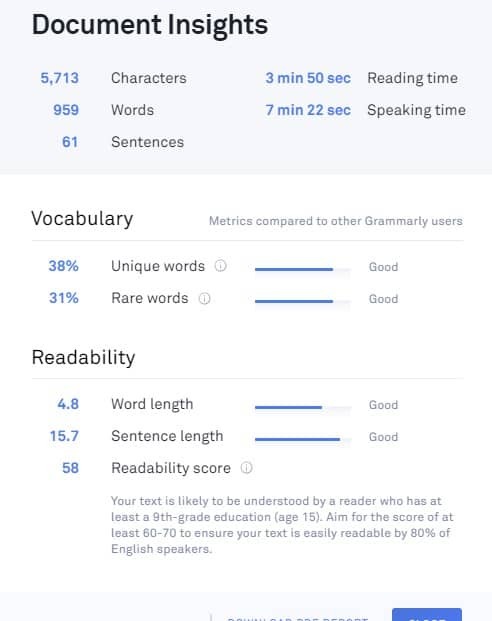 While you working on that, Grammarly will serve as a more than capable guidelines system for computing the readability of the articles using different factors. If you want to edit the article yourself using Grammarly, all you need to do is hover on the suggestions in green and click on them to apply the changes. You will not have to type out the suggestions, so you can edit the article by just clicking on them. If you mistakenly clicked on the suggestion, you can undo the change and revert to the old word or phrase. If you are editing content based on style, the tool lets you choose the kind of style for your article so it can spot errors based on the style you chose to provide you with better suggestions. Of course, I do not suggest that you rely solely on Grammarly Premium for editing articles. There is still a need for you to check and see if the suggestions are acceptable to a human reader. But more on that later. the vocabulary enhancements feature is a hit or miss. It suggests synonyms for overused words and phrases. As a result, the feature offers some awkward suggestions at times. ‘Campaign’ is synonymous to ‘drive.’ But in the context of this article about marketing by Neil Patel, a drive is not an appropriate replacement. I understand that the enhancements are suggestions for a reason — you do not have to follow them if you do not feel that they provide a better alternative for the overused word or phrase. This is also why you still need to edit the article your way instead of completely relying on Grammarly Premium for spotting and correcting the errors. As mentioned, Grammarly Premium is available to Microsoft Word only as an add-on. However, if you prefer using a different word processor like WPS Writer or Open Office, you won’t be able to enjoy Grammarly Premium as much. You will have to download the desktop version of the app instead. This means you will have to write the article on your word processor, upload it to Grammarly Premium and edit from there. Once finished, you download the file and remove the comments from the document before you can submit the article for publishing. Writing on the native Grammarly app is an alternative. However, if you include links or images in your article, then this is not a feasible solution. The most likely way to this problem is to download the Chrome extension and write your articles on Google Drive. However, if you are much more comfortable writing on a native word processor, then this solution may not appeal to you. While this particular issue may be a minor quibble, this could drive old-fashioned writers away from using Grammarly Premium. Then, there is no reason for you to NOT provide impeccable content with Grammarly Premium in tow! Simply put, Grammarly Premium is the only tool that serious writers, editors, and bloggers need to improve their writing.